AFTER, BEFORE and ALL THE PREPOSITIONS are followed by GERUND. We use the gerund after go + activity (especially sports). 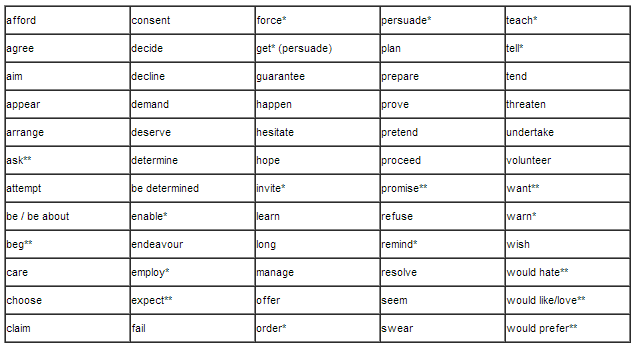 All verb + preposition and verb + object + preposition are followed by gerund. Note: ‘help’ and ‘dare’ can be used with or without to. ‘Make’ in the passive is followed by to + infinitive. With an object after ‘would rather’ we use Subjunctive. All the verbs of sensation (see, hear, feel, smell) can be followed by gerund or infinitive without to. E. g.: I forgot to lock the door. I have to go back. E. g.: I will never forget meeting her for the first time. E. g.: After writing his homework he went on to learn the words. E. g.: Don’t stop, please. Go on reading the next paragraph. E. g.: I like to go to the dentist twice a year. E. g.: I like eating pizza. E. g.: I didn’t mean to hurt you yesterday. I just lost my temper. E. g.: Shopping in the Tesco means standing at the cashier for hours. E. g.: I need to go to the dentist. E. g.: This room needs painting. E. g.: I propose to go to the dentist. E. g.: He proposed going to an another restaurant. E. g.: I regret to inform you that you failed the test. E. g.: I regretted asking him to cook dinner. It was awful. E. g.: Remember to turn the gas off before you leave. E. g.: I remember playing chess with my dad when I was a little. E. g.: We stopped to smoke a cigarette then got back to the car and continued our trip. E. g.: Yesterday I stopped smoking. I will never light a cigarette again. E. g.: I tried to open the box but it was locked. E. g.: I have a terrible headache. I think I’ll try taking an aspirin. E. g.: I saw him cross the road. E. g.: I saw him waiting in the bus stop.